Coi Rubber Products, Inc. is a custom manufacturer of molded rubber and plastic components. Coi Rubber has over 28 years of experience in Engineering, Design, Compounding, Prototyping, and Production of molded rubber and plastics. Our capabilities include custom material compounding, injection molding, compression molding, transfer molding, extrusions, rubber-to-metal bonding, insert over-molding, and more. Our high volume production lines and quality guarantee are supported by our ~1.5 million sq. ft. of US-owned manufacturing facilities and testing laboratories. 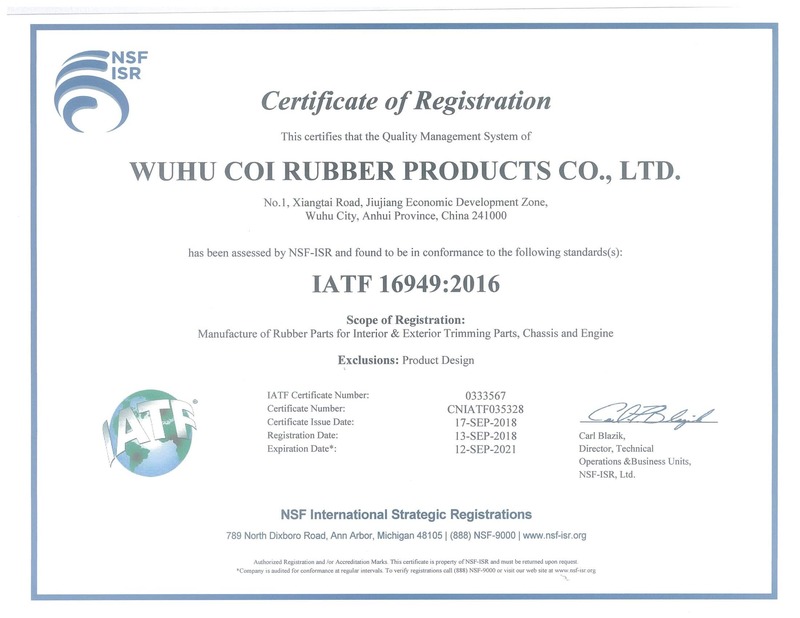 Coi Rubber Products holds the following certifications: IATF 16949:2016, ISO 9001:2015, and MBE. Coi Rubber Products was established to service the Rubber & Plastics Industry. We started in molded rubber products serving the agriculture industry. Since then, we have expanded our manufacturing capabilities to include plastic molding, extrusions, metal stamping, and bonding to support our increasing product lines. We serve a wide variety of companies in different industries; some industries include the Automotive, Industrial, Food Processing, HVAC, Appliance, Sports, and Baby Products. We pride ourselves on our expertise in polymer material and molding, meeting or exceeding our clients’ requirements for any custom rubber or plastic products. Our experts are able to provide cost-saving solutions on high quality products. We offer competitive pricing, fast lead time, US local customer service, and engineering support. Find out more about us by calling today! Rubber is conformable, adaptable and can accommodate movement, shock, thermal changes tolerances and roughness. Coi Rubber Products has over 28 years of experience in meeting customers rubber molding needs. As a rubber manufacturer, we produce custom gaskets, seals, bumpers, and an endless variety of custom products from natural and synthetic rubbers and elastomers. With proven services such as design support, custom material, prototyping, and full production from our manufacturing plants, companies in every industry trust us to deliver and support their product lines. Our combination of comprehensive product range and in depth “know how” means we are well placed to provide effective solutions for engineers and buyers with the challenge of keeping industry moving. As a company, we pride ourselves on supplying the best quality products at very competitive prices. We strive to react to your needs as quickly as possible and pride ourselves on meeting the demanding delivery requirements of our global customer base. Common Materials for Molding: EPDM (Ethylene Propylene Rubbers), Natural Rubber, Neoprene (Chloroprene Rubbers), SBR (Styrene-butadiene), Hydrin (Epichlorohydrin) Rubber, Silicone Rubber, HNBR (Hydrogenated Nitrile Rubber), Nitrile Rubber (NBR, Buna N), Platinum Cured Silicones, Fluorosilicone Rubber, Fluoroelastomer Rubber (FKM) (Viton*), Butyl Rubber, Polyurethane, TPE, Vinyl, Thermoplastic Elastomers, Polyamide Nylon and Glass-filled Nylon (PA 6, PA 6/6). Common Materials for Gaskets: Nitrile, Silicone Sponge, Neoprene Sponge, Neoprene Rubber, adhesive backed rubber or foam gaskets.